From our peoples in struggle, from within our resistance and rebellion, we send our words as a reflection of this part of the country that we have constitute and call the National Indigenous Congress. We are gathered by the pain and the rage that call to us because it is a pain and rage that we share. 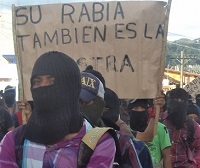 The disappearance of the 43 student compañeros of the Normal Rural Isidro Burgos of Ayotzinapa, Guerrero, kidnapped and disappeared by the Bad Governments, imposes upon us a shadow of mourning, angst, and rage. Our hope for the reappearance of the compañeros is also the pain that unites us; our rage illuminates the candles that today light the way of mobilizations all over the country, raising the cry of dignity and rebellion in Mexico below. We know that as long as this country is governed by criminals, lead by the supreme paramilitary leader Enrique Peña Nieto, those who strengthen their political and social conscience by exercising and defending education will be murdered and disappeared, and those, like the Yaqui Tribe, who defend water for their ancient and heroic people, will be imprisoned. The Mexican government has tried to minimize the criminal repression of the student compañeros as if they were just a few more victims of delinquent crime, as they have done time and time again across the country. They may be just a few more dead for the media, but those of us who have suffered many kinds of repression know that that the delinquents are in the political parties, all of them, in the house of representatives and the senate, in the municipal presidencies, and in the halls of government. Ayotizinapa pains us. The 43 students are still missing and the State acts as if it doesn’t know where they are, as if it wasn’t the State itself who took them. They try to disappear our conscience as well, but today the disappeared are present in the thoughts of this whole country, in the attentive gaze and the heart of those of us who make up the National Indigenous Congress. In this country there are dangerous mafias, and they are called the Mexican State. We disturb and bother them, we who struggle, we who have no face—who have had it torn away—we who are nobody, we who see and feel the violence, we who suffer multiple and simultaneous attacks, we who know that something terrible, very terrible, is happening in this country: a war against all. It is a war that we below see and suffer in its totality. 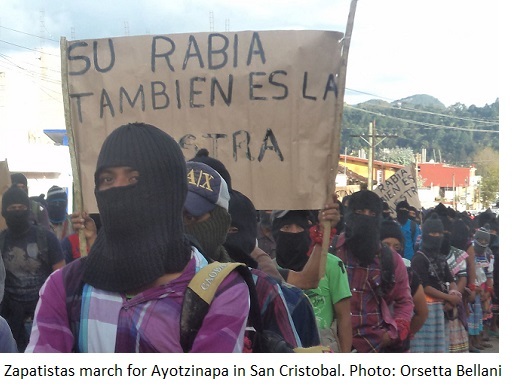 We reiterate today that as long as our student compañeros from Ayotzinapa do not appear alive and well, as long as our brothers Mario Luna Romero and Fernando Jiménez from the State of Sonora continue to be held prisoner for defending the sacred waters of the river Yaqui, as long as they remain kidnapped by the bad governments, we will continue responding accordingly. Their pain is ours; their rage is ours! [i] The Escuelas Normales in Mexico are teaching colleges that principally train rural and indigenous young people to be teachers in their own communities.